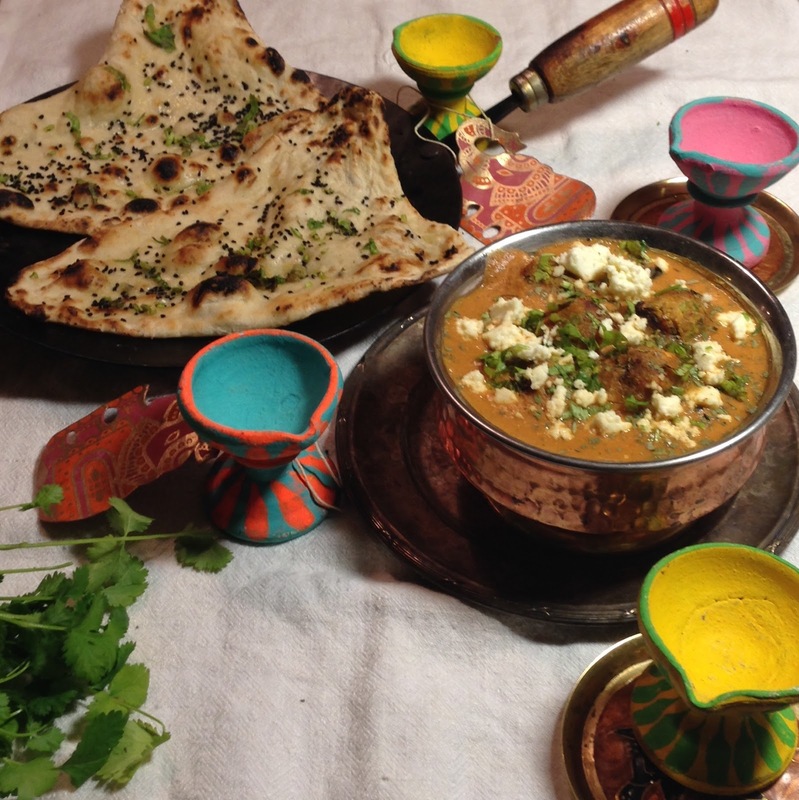 Malai kofta is a rich northern Indian dish. 'Malai' means cream or butter, and 'koftas' are a patty of sorts. The koftas consist of paneer, potatoes, dried fruits and nuts, and the sauce is a buttery, tomatoey, spicy and often creamy gravy. Often times the gravy is without tomatoes, but to me, a dish without tomatoes is often lacking -- at least for malai kofta. I love this dish because the koftas are full of texture, crunchy with the nuts, slightly sweet with dates, while being spicy, saucy and just rich enough. My wonderful aunt Kusum sent me this recipe because I was craving it. Her recipes are always really accurate. The koftas are traditionally deep fried, but I refuse. I think it's unnecessary to fry when it will be later de-crispened by the sauce. So I bake them instead, and they work perfectly well. 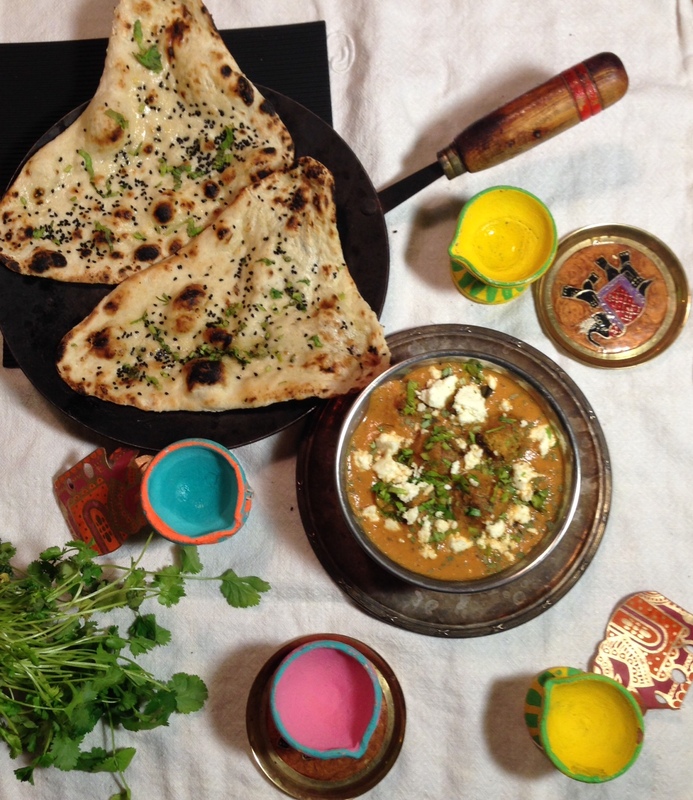 It is a step up from paneer makhani, our favorite Indian dish at home. We enjoy them with homemade naan, but if you're watching your calories, it is perfect with chapatis which are similar to whole wheat tortillas. 1. Preheat the oven to 220C or 450F. 2. In a large bowl, add the grated potato, carrots, paneer, peas, potato starch, spices, coriander, cashews and dates. Mix and taste for seasoning. 3. Line a baking sheet with parchment paper, then drizzle about 3 - 4 tablespoons canola oil. Form about 1 tablespoon size balls and roll each ball in oil so that it is nicely coated. Repeat with the rest. 4. Bake the koftas for 10 minutes, then flip them for even browning. Once they are golden, turn off oven and leave in the oven while preparing the sauce. 5. In a saucepan, add butter, oil and onion and sauté on medium low heat until golden. Then add the garlic and ginger, cook for a minute, then the garam masala and ground fenugreek powder. After a minute, add the tomatoes. Cook for 15 - 20 minutes, until the tomato juices have evaporated and the mass is thickened, and then add 3 cups of water along with the ground cashews. Cook for another 10 minutes. Add extra water for a runnier consistency. 6. Puree the mixture until completely smooth. Taste for seasoning. Add cream (if using) and cook for another 5 minutes, and then add the koftas into the gravy, cover, and turn off the heat. Allow 5 minutes for the koftas to absorb the sauce. In a separate pan, toast the dried fenugreek for a few seconds until it becomes crisp. Rub the fenugreek in your hands and sprinkle over the sauce. Garnish with fresh coriander. Enjoy with naan or chapatis. I made this last night and it was incredible. Thank you so much! Thanks Kristin, glad to hear it!